How to Enable Chat Heads for WhatsApp in any Android/MIUI Phone? - IT ADDA! Hey there, If you use Facebook Messenger then I’m pretty sure that you have seen the Chat Heads feature of it. The chances are, You might also be using it on your phone. But, Have you heard of WhatsApp Chat Heads? Yes, You can use this feature for WhatsApp also. And not only for WhatsApp but almost every social networking apps like Twitter, Google Hangout etc. In the video below, I have shown you the complete process on “How you can make it work on your device?”. It is for Android Devices Only. The language in the video is Hindi but if you don’t understand Hindi you can use the English Subtitle by clicking on “CC” on the video. 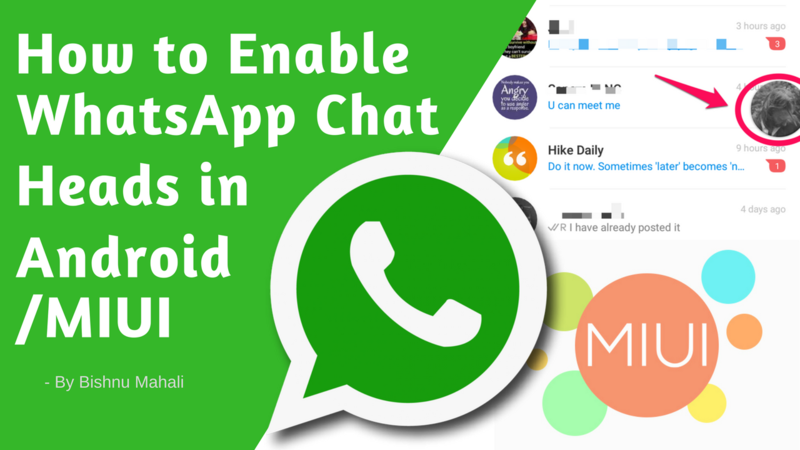 The main purpose of this video was to solve the problems of MIUI Users but it will also help any Android user to guide them to use Chat Heads for WhatsApp on their phone. So that was it, Let me know if you want me to write a complete post on this (with screenshots) in the comment box below. If you Liked the video, Give a Like to the video on YouTube and also Subscribe to Our YouTube Channel to watch more videos like this. Don’t forget to share it with them, who might find it useful. At the end, thanks for being here, Have a Nice Day! Also read: How to Update or Change The Nameserver of Your Domain?